A garden snail is a small creature with simple needs. You can keep pet snails in a small container, providing you care for them properly and make sure they receive enough air, water, calcium and food. Here, you’ll learn basic tips for housing and caring for pet snails and some interesting facts about snails as well. 1. Wash and dry the container. Make sure the container lid has vent holes large enough to allow air inside, but small enough to prevent the snails from escaping. If you don’t have a lid, fold cheesecloth or gauze into a double layer then cut a suitable shape to cover the top of your container. Set aside your lid or cover for now. 2. Add a shallow layer of gravel to the bottom of the tank for drainage. Top the gravel with an inch and a half of soil or soil topped with another substrate such as spaghum moss, coir or peat. 3. Add a shelter for your new pets. A small plastic pot, placed on its side and half buried in the soil, works well. You could also make a miniature lean-to by leaning a piece of bark against the container wall. Snails love this kind of hideout. 4. If you like, tuck little plants, like creeping thyme and moss, into the soil. Add bits of bark and small dried leaves. Water the plants and soil until the soil is moist but not soaking wet. Essentially, you now have a small terrarium that is almost ready for its new inhabitants. 5. If you haven’t already got the snails, now is the time to find some. Garden snails are plentiful in summer time. You’ll often them on the underside of leaves or crossing the lawn after a rain. Gently pick up each snail by its shell and place it in the terrarium. A large mason jar can hold two snails; a small tank, like the one shown here, which is about six inches long by four inches deep and five inches high, is big enough for up to four snails. 6. Add some food for the snails. Offer as much variety as you can. They enjoy many fruits including apple, blackberries, kiwi, peach, pear, plum, raspberries and strawberries. Also offer vegetables like cucumber, tomato, a baby carrot cut in half lengthwise, lettuce, cabbage, kale, or dandelion leaves. Observe snails outside and see what other leaves they enjoy eating; chances are, your pet snails would like the same lunch. Small pieces of wet or dry cat or dog food, or tortoise food, can also make good snail food. 7. Snails need a source of calcium and minerals to build their shells, so place a piece of egg shell or natural chalk in the tank as well. Cuttlefish from the pet store can also be offered. Remember to replace the lid on your snail house after adding food. If you’re using cheesecloth or gauze, tie it down or fasten it with a rubber band. You don’t want snails escaping into your house and hurting themselves or frightening other people. Change the food every day, removing uneaten leaves and replacing with fresh foodstuff. Every few days, wipe down the glass walls of the terrarium with a sponge. 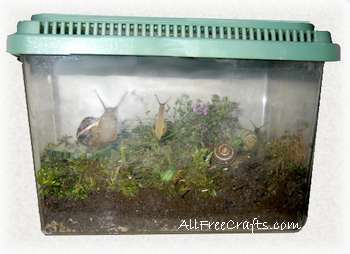 If the soil is drying out fill a clean spray bottle with water and mist the inside of the tank (and the snails) with water until the soil is moist but not overly wet. Once a week, remove everything from the tank, wash and rinse it, then build a new layer of substrate. Rather than planting new plants, try laying a bed of dandelion leaves across the top of the soil. The wilted dandelion leaves serve as a playground and as a plate for more food. In a day or two, when its time for clean up, just remove the dandelions and any food left lying on top of them. Remember to wash your hands after handling your pet snails, or after cleaning their terrarium. Native snails can live up to 15 years. A nice thing about garden snails is that if you can’t care for them any more for any reason then you can just release them back into the wild. Each species of snail has a shell pattern that is common to all its members. Snails that live in cold regions build up natural antifreeze in their blood to prevent freezing. Snails cannot tolerate sudden temperature changes, but their bodies adjust well to gradual climate change. During hibernation, their heartbeats slow down and the amount of oxygen they consume is vastly reduced. The Living World of Molluscs – Keeping snails as pets; anatomy, body structure, organ systems, habits, history, types etc. Land Snails, Wikipedia; characteristics, hibernation, reproduction, predators, snails as human food. Comprehensive Snail Care Guide – housing, substrate materials, feeding and watering, handling, cleaning and breeding.